about what happens when a group of scientists see themselves as a monolithic élite with a strong sense of consensus and a “disregard for and disinterest in the ideas, opinions, and work of experts who are not part of the group.” He’s talking about proponents of string theory, citing a paper by Smolin from 2006. As John notes, there’s a big difference between the quality of those working in the field of theoretical physics and climate scientists. Christopher Booker has recently noted the dangers of groupthink, which can affect any group sufficiently removed from reality, apparently independently of IQ. The difference between the physicists and the climate scientists lies not in their psychology, but in the nature of their links with the outside world. No-one’s going to make headlines with dire warnings of the implications of string theory, and no government is going to pass a law aimed at limiting its effects. The key problem is not in the science, however crappy it may be, but in the links between it and the media and the wider world. In fact, maybe the problem isn’t in the science at all. Perhaps the science is entirely irrelevant. I’ve just been watching an item on CNN in which Hala Gorani interviews Dr Michael Byrne or Imperial College, London about the current wave of hot weather. She knows less than nothing of course, except that she knows what the deniers are saying, and she knows that they’re wrong. She was also entirely uninterested in anything Dr Byrne had to say until he mentioned the heatwave of 2003 and its 20,000 early deaths, at which she expressed surprise. “These figures aren’t widely known,” she said. Of course they aren’t. They’re made up. The French Wiki page gives 47,000 deaths for Western Europe, the English page 22,000, while the Chinese version gives 35,000 deaths. Since a premature death is one that wouldn’t have happened so fast if it wasn’t for something or other, and since whatever you’re doing is probably taking a month or two or two off your life (so, whatever it is, please stop it) all deaths are premature. Deaths in Italy shot up when someone at the Ministry of Health realised this was a good way of getting an increased budget. It’s not what you count that counts, it’s the way that you count it. And why. String theory began to unravel for me when they came up with this infinite number of universes thing. If there’s so many of them, let the poor suckers in some other universe finance this CERN stuff. I’ve got enough to be sceptical about, thank you very much. Geoff makes a good point about premature deaths. It’s not what you count that counts, it’s the way that you count it. And why. Reminds me back in the 1980s about the case in the USA for retaining the 55mph speed limit imposed in the 1973 oil crisis. Compared to any higher speed limit, there were less deaths on the road. It saved lives. But Americans on average spent a lot of time travelling on roads with this speed limit. Compared to say a 70mph limit, it was calculated that more lives were “lost” by the extra time spent driving, than were saved from less road traffic accidents. That is because a death through a road traffic accident is a premature one, not the death of an immortal. As a hypothetical example, imagine the average commuter of 40 years old travelling 20,000 miles a year on the Freeway. They would expect to live to 85. With 50mph average speed (55mph limit) that would be 400 hours per years, with 60 mph (70 mph limit) average speed 333 hours per year. The hours saved by the higher limit are just 67hrs. That compares with about 400,000 hours left to live at age 40. If there is greater than a 1/6000 chance of the person dying in that year in a road traffic accident on the freeway then the lower speed limit is a waste of their life. But the cost-benefit approach of regulation is rarely applied to policy in general, particularly to climate policy. Climate “science” seems to be a highly extreme example of vague theory, with plenty of folks act as gatekeepers in preventing it being confronted with the empirical evidence; making it more vague; and using offensive and diversionary counter-strikes to prevent any confronting of theory or policy with empirical reality. String theory may have issues, but climatology has these and a strong ideological dimension on top. Your Feynman quote is very telling. If the best the scientists can do is tell us that temperatures will likely rise between 1 and 4°C in the lifetime of our grandchildren, and the best the economists and other prophets can do is make vague speculations about our ability to adapt in 50-100 years time with technologies that haven’t yet been invented, then we’re living in fantasy land. Which is where a generation brought up on Star Wars and Harry Potter are anyway. The increasing vagueness of our data is matched by an increasing precision of our means of expression. It used to take me half an hour to prepare a neat-looking bar chart with set square and Letraset. Such presentational tools can now be produced instantaneously, free as air, or as a photo of a flood or tornado. Politicians and other deciders are the slaves of their tools, and many of those tools are working in climate science. In respect of setting safety targets, the relevant concept here is that of Minimum Endogenous Mortality (MEM). People are dying all the time due to a myriad of reasons. This death rate (usually expressed in deaths per year) is easily determined for a given population, and this provides the baseline against which the acceptable mortality risk for a given system can be determined. Basically, any new system may be determined to be too dangerous if the resulting death rate within the target population were to increase by more than 5% above the baseline level (i.e. the MEM). Other concepts for setting safety targets include ALARP (As Low As Reasonably Practicable) and GALE (Globally At Least Equivalent) but these differ from MEM insofar as they do not allow for the ‘natural’ death rate that may occur regardless of the introduction of the system of interest. GALE, however, is an interesting one since it emphasises the need to take into account all risks (and by inference all stakeholders) when calculating the impact of an initiative or intervention. The safety target is met only if the net level of risk (i.e. the ‘global’ risk) remains the same. For this reason, one has to be aware that compensatory behaviour may introduce new risks that have to be factored into the calculation. For example, improving the braking systems of automobiles has encouraged more risk-taking behaviour within motorists. Of course, when calculating safety risk levels one has to take into account both the degree of hazard and the degree of exposure to the hazard. Such calculations can be difficult. Thanks Geoff, very generous praise for my wee bit post. Primary credit is due to Smolin for his comments on string theorists. Secondary to Munsch for linking them by analogy to the climate alarm theorists. Tertiary to Judith Curry for drawing attention to all this at https://judithcurry.com/2018/07/22/the-perils-of-near-tabloid-science/. So quinary for me! I did add some additional perspective re the puzzle of the whole sorry business, and the possibility of helping those who have taken it too seriously. Yesterday there was an interesting Guest Post at WUWT that is directly relevant to this post. It shouldn’t take hundreds of years to estimate climate sensitivity. What climate models actually suggest is that true long-term climate sensitivity will be very similar to the sensitivity one can infer from the historical record. Okay, so then why don’t climate models actually diverge when reproducing the historical record? Because the high-sensitivity models have less forcing and / or more heat going into the ocean. If the same forcing and ocean heat uptake levels were applied to all climate models then the divergence between models of different sensitivities would be obvious. Climate models are extreme examples of Feynman’s definition of “vague” theories. In AR5 WG1 FigBox 3.1-1 it was estimated that 90% of the heat uptake in a 40 year period was in the oceans. 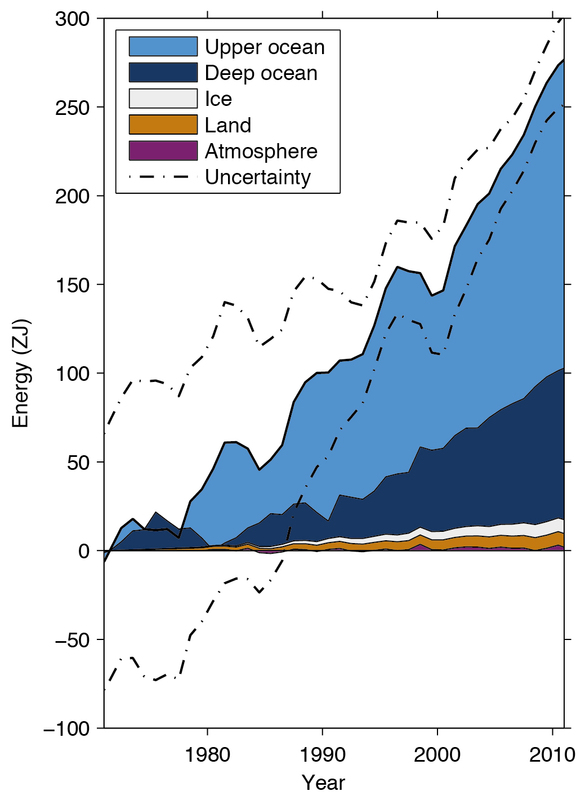 The atmospheric heat uptake is a tiny figure in comparison. As well as emphasising the essentially non-scientific process by which consensus was established within theoretical physics (of all fields) I was keen to observe the irony that those who point out the unscientific nature of such a process are themselves the most likely to be accused of being anti-scientific. The same goes for those who make that observation of climatology. Whilst I’m on my ego-fed hobby horse, I would also like to point out that I returned to this subject in an article written for this blog in March 2018, The Scientist and the Bluebottle—A Cautionary Tale, where I pointed out in that the differing public attitudes towards the dubious consensuses to be found within theoretical physics and climatology lie entirely within their respective social imports. Strangely, this article is not considered to be related to ‘Stringing us Along’, despite covering identical issues. I’m sorry to be so childish about this, but one writes these articles in the hope of being noticed. You are not being petty-minded at all. I have just read you long article at WUWT. It is worth a read. This paragraph I particularly like. (T)here is plenty of room to be cautious regarding the nature of the mathematical models used to predict the evolution of the Earth’s climate system – a system that is known to be open, driven, non-linear, hugely complex and chaotic. The extent to which any credence can be placed in such models depends upon how well they capture the relevant factors at play and how realistically and accurately such factors have been parameterised. Furthermore, even for a comprehensive and accurate model, predictive skill rests upon the extent to which noise and the climate system’s dissipative forces can stabilize the climate on the large scale. Unfortunately, in view of the significant structural and parametric uncertainty within the models, it may be delusional to premise confidence levels upon the assumption of well-defined aleatoric uncertainty. The cliscep article is a great polemic. I hope you received the highest standards of corrective treatment. Good to see John Shade commenting here again and credit due to our other John who raised similar points in March on this very subject which I must admit I had forgotten about, even though I commented on that article. I’m pretty sure that 99% of all stuff that’s written with regard to the Great Climate Science Debate has been written about before, by somebody else, on a different blog, somewhere in space and time, in a slightly different context. We are all doomed to obscurity in some respects by our lack of constant output, our own forgetfulness, the constantly shifting ‘here and now’ focus of modern online debate and our relative low key status as sceptic bloggers, even though we each have much to contribute. I agree, it’s frustrating. I almost believe that there is such a thing as a Law of Diminishing Impact for us climate sceptic bloggers. It seems, once you’ve announced yourself to the blogosphere, made your mark and been linked to at other, more prominent, highly visited blogs, you are thenceforth condemned to be increasingly, incrementally, less influential, as time goes by, unless your output is truly prodigious and/or you are lucky enough to have a prominent reporter/commenter who regularly references your blog/work. I don’t agree entirely with this. The root of the problem is the science. The reason the problem of the poor science has been magnified so grotesquely and damagingly is multifold: human psychology, social science, economics, naked opportunism, unfortunate coincidence even. They’ve all played their part in propelling climate alarmism to the top of the political and media agenda for thirty odd years, where it has wrought untold damage upon the environment, upon science, upon our economies, upon the public’s trust in scientists and politicians who, at times, have often appeared to be one and the same. If you take away all the accumulated hubris which has magnified and obscured the problem of climate alarmism, you come down to one very simple fact: there is virtually no direct, empirical, scientific, observational validation of the claim that GHGs emitted by fossil fuel burning are responsible for most or all of the global warming which has occurred since 1950 (or 1850, according to some). Further, there can never be any empirical evidence to support the notion that warming will continue into the future and become ‘dangerous’ in the next century. The ‘overwhelming evidence’ so lovingly quoted by alarmists in support of AGW consists entirely of a wealth of low quality, incomplete, adjusted, homogenised, parametrised, glamourised, data, fed into immensely complex coupled Atmospheric Ocean Global Circulation Models, which, after performing billions of calculations in cyberspace, for days or weeks on end, tell us that ‘we have a problem’. In the case of climate science, it’s not so much that it is data-poor, but that the data (which is abundant) IS poor, and thus is inadequate to scientifically, experimentally validate the claims of those working in the field that AGW is both real and is very likely ‘dangerous’. Not only is the observational data poor in terms of spatial/chronological coverage but it falls almost exclusively into the category of ‘circumstantial’ as opposed to ‘direct empirical’. Then of course there is the other ‘data’ which scientists and alarmists euphemistically describe, which is not data, but which is spat out from main-frame computers running climate models fed with parametrizations and actual data. No wonder the public is confused and sceptical! My apologies for not having mentioned your article. Put it down to the forgetfulness of old age. The choice of “articles related” is made by WordPress I’m afraid. We at Cliscep don’t communicate with each other much, unlike say, the chaps at SkepticalScience, as revealed in the Treehut Files. That way we don’t fall prey to Groupthink. My stupidity is all my own. Your summary of the plight of the climate sceptic blogger is spot on. Even so, I am only human and as susceptible as the next person to the occasional fit of ill-judged self-importance. As with Manic and Jaime, I appreciate your efforts to sooth my precious ego. I have often wondered how the related articles are chosen. I am relatively new to this blogging thing, and so even basic processes are still a mystery to me. As for the groupthink issue, I think it is a particularly healthy feature of this website that the sceptics occasionally turn on each other with a passion that sometimes exceeds that reserved for the alarmists. Contrary to the received wisdom, climate scepticism takes a variety of forms and comes in many degrees. This is certainly not about soothing your precious ego. I made a mistake and I sincerely apologise for overlooking the fact of your article covering the same ground. This was simply inefficient of me, and unintentionally rude, since yours was a serious and well-researched article, while mine was just a rumination on JOHN SHADE’s article which I’d just come across. You ask how the articles are chosen. Mostly they’re not. At the beginning we alerted each other to posts we’d just written, seeking comments in a primitive form of peer review. This sometimes led to delay, and now I only pre-post and invite comments if the subject is delicate or might arouse opposition. Basically we just write what we feel like. Might you all consider a previous suggestion to have an open thread similar to BH’s unthreaded? This received favourable comments and was to be considered by you big muckymucks “after Easter” but I don’t believe there was any outcome that was transmitted to us plebs. It’s only bonkers if you’ve taken the Cool Earth Aid. A road trip to Ulan Ude sounds quite fun, and the flight from Ulan Ude to the Andes would surely be epic. Why don’t you take the Cleo? I should have made it clearer, but I was actually referring to the mechanism by which articles are identified as ‘related’. However, the selection of articles for publication was also an interesting question. And yes, why not write a declaratory article – seems a good idea. In all the above cases, the level of evidential support fails to explain the strength of advocacy, and the credibility gap reflects the vital role played by culture in the development of institutionalised belief systems. The list should, of course, be a lot longer, but this is what I could come up with without having to think too hard. John. Would you add “Second hand smoke and cancer” to your list? Or has the evidence base changed without my noticing? It is not on my list purely because I haven’t paid much attention to it. I am aware that it would be on many other people’s lists and I wouldn’t be surprised if it were to be one of those data poor health scares that we seem so fond of generating, but I have yet to look into it myself. John Ridgway, I don’t think your lament is ‘childish’, but I must in my defence point out that I had not come across your WUWT piece last year, not even the one published here earlier this year. Both are excellent contributions, imho. There have been spells of weeks at a time when I have not read the climate blogs, and that may be my best excuse. Anyway, on my earlier ordinal labelling, you move into tertiary place, and push me even further away into the senary one. Ah well. On the bright side, this post by Geoff has led, through the comments, to more people studying your climate writings. Geoff, at 1.4 she is too mighty. Max 1.2. I must admit that it felt to me as though I was tossing my dummy out of the pram, and I was aware that I might be coming across as an attention seeker. But there again, that’s exactly what I am. Why else would I be posting articles on the internet? The only consolation is that my behaviour is entirely in keeping with the human condition. I should have just been grateful that you and Geoff were giving prominence to opinions that I think should be given prominence – but I don’t think I was quite mature enough for that. The least I can do now is thank you for your contribution and express my appreciation for your kind words. John. The reason for suggesting that the evils of passive smoking might be added to your list is that advocates of CAGW commonly link the denialist activities of their opponents with those of tobacco companies denying the effects of second-hand smoke. As a former smoker I took interest in the EPA decision to brand second-hand smoke as carcinogenic. I believed at that time that the evidence was far from convincing (although subsequently I have been “informed” that this view may have been heavily influenced by nefarious activities of the tobacco industry). It even employs heavyweight words like “consensus”. I remember when I was a cub in 1968 in the boy-scouts movement that our scouting group used to organise bingo evenings. As a seven year old I sat in the midst of grown ups who would light one cigarette with the next one and the hall was blue with smoke stinging in my eyes. As a ten year old my primary school teacher was a chain smoker with the windows closed in winter. I bet those levels of second hand smoke could be detrimental.